The first 9 are as in Shilin Guangji. Has commentary； at end says "二卷終"
Related to 1425; lyrics "惠風膏雨沐花天，紫陌青門...."
Only 1573, here and 1618; lyrics attrib. 馬存字子才 Ma Cun; 11th c.
Sets to music five poems from a collection of Xing Xin (Awakened Mind) poems in a compendium of writings connected to the "林兆恩 三教合一 Three in One Religion of Lin Zhaoen (1517-1598)." Lyrics and music related to 1511, etc. The lyrics here refer to Nanchang and Hongdu, but the Columbia edition translation calls them 豫章 Yuzhang and 洪州 Hongzhou, which are more ancient names within the same environs. Perhaps there are differing editions. The attached commentary says that when first built the pavilion "was considered to be the tourist spot par excellence in the south." "Departure at the River in Autumn"; in 1573 the same melody is "Departure at the River in Spring"
Only here (and 1573). Mode not indicated, but seems to use standard tuning. 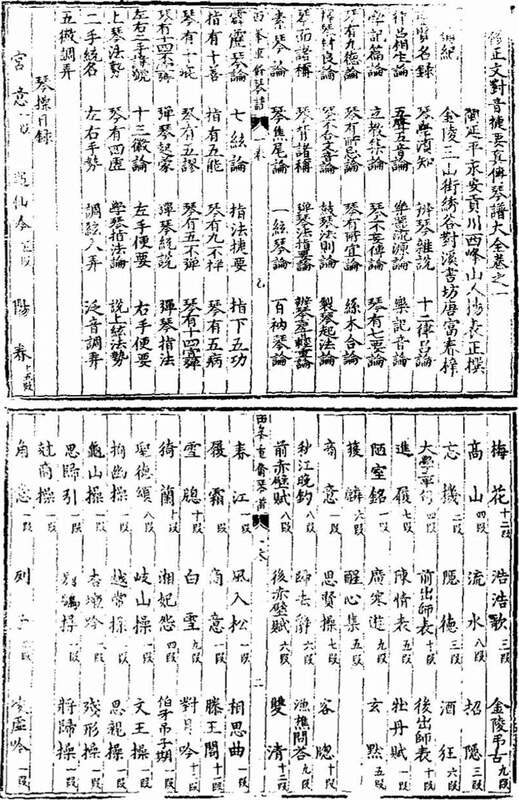 The 105 pu (tablatures) in this qinpu (qin handbook) include 45 of the 64 titles from 1425. Noticeably missing is the piece Intonation for Poetry (詩吟 Shi Yin) from 1573. "E" (as in "#18") is a reference to the respective page in the electronic version (here a pdf) of the 1573 edition.